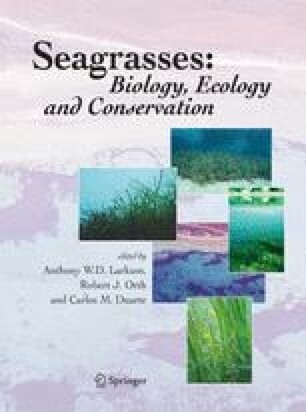 The nine species comprising the genus Zostera discussed in this chapter form a widespread and relatively well-studied group of seagrasses. Some of the earliest studies of seagrasses occurred within the genus Zostera, especially the extensively researched Zostera marina L. (Petersen, 1890, 1918). The proximity of this species to industrialized areas and centers of scientific investigation in North America, Europe, and Asia has encouraged a continued scientific focus. Like all seagrasses, those of the genus Zostera live in intertidal and subtidal inshore waters, forming a critical habitat and a basis of the foodweb. Study of the genus Zostera is itself representative of trends in seagrass science, with PAM fluorometry assessments of photosynthesis and genetic investigations among the newer efforts.We here review the current knowledge of this important genus, although space constraints do not allow exhaustive coverage of all past and current Zostera research.We also point to future research directions.